After researching and writing about many different aspects of the cloud this past year, I jumped at the opportunity to make an actual visit to this mysterious and important place. No, I wasn’t catching a flight into the wild blue yonder of the stratosphere or taking a breathtaking gondola ride up some imposing, lofty Swiss alp… I was actually heading to a data center near our Reston location. One of our skilled Network Depot technicians was kind enough to take me along during one of his regular visits to this location, and he was also patient enough to fill me in on some of its interesting features. As noted in previous blog posts, the cloud is important for many aspects of IT use at work and home. Cloud computing or going to the cloud in simplest terms, means using a server or servers at an offsite data center location to house any or all of your company’s email, file storage, online backup, accounting and business applications. 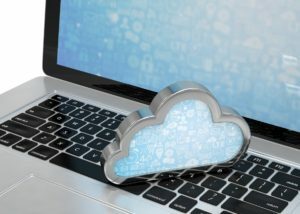 In the cloud, these functions are accessible to users at any time through the use of an internet connection as opposed to being stored on a server and/or desktop at their office location. The goal of my visit was to experience an offsite data center location, or the physical environment where the cloud actually exists. Non-descript: That’s the first adjective that struck my mind as we pulled into the parking lot. The flat warehouse-like building with few windows looked like many other similar buildings you would find in any commercial warehouse or office park district. The technician was quick to point out that the data center we were visiting is relatively modest-sized in comparison to some of the mammoth ones operated by Amazon and Google, for example. However, its features are generally representative of data centers around the world and are described below. I noticed security cameras at the front and back entrances and noted that our technician had to swipe a photo ID key card and enter a code on several occasions before we made it into the area where the data servers are located or housed. It is definitely a secure location. The technician commented that some higher security level data centers have elaborate fencing and more security personnel. As we walked down the first hallway, I noticed a glass-enclosed operations center on my right reminiscent of the NASA Mission Control Center in the movie Apollo 13. However, there were no frenzied employees scrambling around trying to make things happen before disaster struck, but rather a few calm individuals monitoring a vast array of screens and systems. Everything seemed to be functioning like a well-oiled machine. There were video monitors for security purposes as well as many screens monitoring the many infrastructure components of the building. One of the first things I noticed as we entered the next area where the servers were housed was the noise. The main source for the loud humming was the complex HVAC system and its many components throughout the facility. Its important job is to keep the servers and other equipment cool and to reduce dust and humidity. The technician told me that some data centers even have sticky mats laid out before entering in order to pick up dirt and dust from your shoes. I was impressed as I surveyed the orderly rows full of metal “racks” that resembled big high school lockers about two feet wide and between 6-8 feet tall depending upon the row. Like in high school, you need a key or combination to open the metal mesh rack door to access the servers and other equipment neatly stacked inside. “Welcome to the cloud,” the technician said with a smile as he opened the metal door and pointed out the rows of servers and other equipment carefully maintained by Network Depot for our own operations and for our clients. Depending upon their needs, companies rent the rack space necessary for their equipment much like leasing office space or a storage unit. Some companies rent space alongside other companies like renting a unit in an apartment building, while others rent the entire space in a rack on their own. Companies receive all the benefits described below as provided by the data center and are able to access their equipment as desired. The technician explained that the space in each rack is normally divided into 42 or 48 units (U), which are each 1.75 inches in height. Servers and other equipment are designed to fit in these spaces and are described by their height size in units, such as a 3U or 4U server. Technicians mount horizontal rails into the racks, so that they can easily pull them out and work on and update their equipment as necessary. On the opposite side of the rack, I was struck by the maze of cables connecting the equipment and leading to the power and internet sources below the floor. I could also definitely feel the heat being generated by all this activity when I placed my hand near the equipment and was grateful that their climate system works so efficiently to keep things cool. Another feature that impressed me was the amount of fire protection equipment I saw in the facility including sprinkler systems, fire extinguishers, and containers with fire suppressing chemicals. The technician also ensured me that there were other monitoring and suppression systems that were not visible. The technician then pulled up a tile on the floor near the rack revealing a hollowed-out space below that extended throughout the building. He explained that the power and internet sources are installed and wired through this space for extra protection. A central feature of data centers is that they have a redundant source of power and internet in case of system-wide outages. As a result, data centers often have their own generators and fuel supply as well as internet connectivity that ensure that their clients’ systems do not suffer from costly downtime. There are varying degrees of uptime guarantees data centers provide their clients as part of their monthly/annual contracts, but they start at 99.67% with a Tier 1 data center. The amount of uptime and redundancy guaranteed define the four different tiers of data centers available. Interestingly, the technician explained to me that there are some new data centers being operated in the southwestern desert, which are totally powered by their own solar energy systems. One doesn’t have to worry about a power outage from that source! 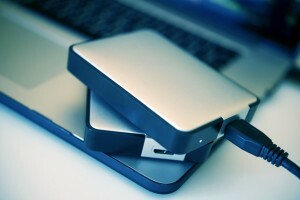 Portable Hard Drives Backup System. Two Portable Hard Drives on the Laptop Closeup Photo. The cloud frees up space and makes overall operations and remote working easier, but a critical benefit of using it is for disaster recovery and backup purposes. Companies benefit from having their data stored and protected at a geographically distinct location that will not be affected by a natural disaster or a localized problem at their site. Also, the redundancy provided by the data center will allow the company to continue operations in the event of a natural or man-made disaster. With the backup features available through the cloud at a protected site, a business can quickly restore operations when they resume work at their current or new location. As I left the building, I felt impressed by the comprehensive infrastructure that has been put in place to make the cloud possible and by all the care and skill employed to ensure it operates smoothly. It was also clear to me that the cloud and its data center capabilities and services will continue to improve and offer many new benefits to their clients. My brief visit to the cloud was over. I was happy to have had the opportunity to see and experience this important place in its physical form. This article was written by Network Depot’s Marketing Director, Chris Sylvester. For assistance with cloud computing or any other IT-related issues, please contact us here at Network Depot.